Are you plagued by chronic hair loss and frustrated with trying almost everything to stop it with no results? How about trying PRP (Platelet Rich Plasma) Therapy? This treatment is for people who want to grow fuller, thicker hair. If you are tired of spending tons of money on artificial means: shampoos, creams, pills, etc. why not try a natural alternative? PRP therapy promotes and stimulates follicle growth within the scalp. Why should you try PRP? The reasons to use PRP Therapy are endless, however, one of the main selling points is that it’s all-natural. It uses a patient’s own blood which forms the basis for the treatment. It doesn’t involve a mixture of chemicals, or hair grafts. 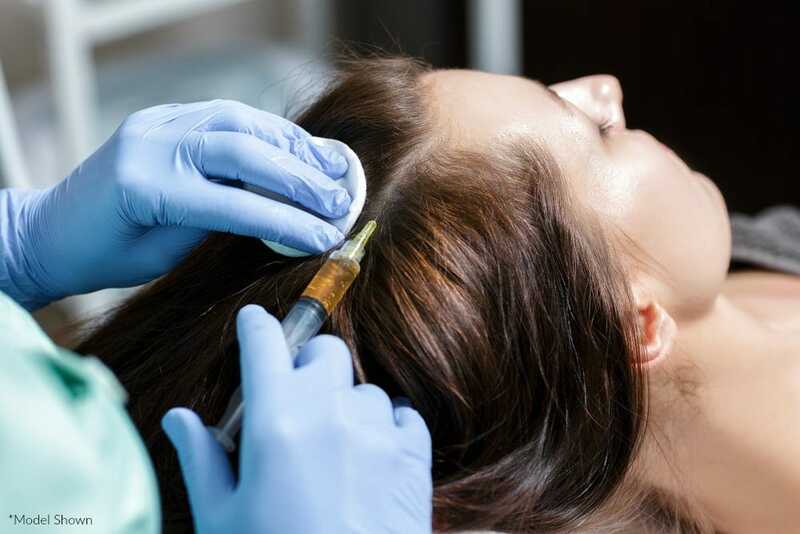 Instead plasma that is separated from the blood is re-injected back into predetermined areas of the scalp. PRP for hair and skin has been shown to have significant improvements. When applied to the face or skin, it increases the collagen production. Rejuvenation of collagen in the face leads to a firmer appearance, which in turn takes years off your face. When this therapy is used for hair restoration, it targets the growth factors within the scalp. The procedure for PRP works by drawing blood from the patients arm and putting in a centrifuge. The spinning of the centrifuge separates the platelet rich plasma, which is then injected back into the designated areas. If it’s injected in the face, or other parts of the body, it will begin to rebuild the collagen. The rebuilding of collagen in the face, or body, fills the areas that have lost volume or begun to sag. The collagen in the face makes the surface of the skin firm, taut, and plump, renewing the youthful quality. When it’s injected into the scalp to renew hair growth, the growth factors within the plasma stimulate the follicles within the scalp to grow. The number of treatments depends on each individual and is up to the practitioner’s discretion. However, the typical course of treatment is between 3-6 sessions, spaced 4-6 weeks apart, and maintenance is every 6 months thereafter. The results after the treatment vary between individuals. Before the patient receives any treatments, we can see the areas where the hair is thinning and sparse; but afterwards, the PRP Therapy shows improvement with hair growth in these areas. If you would like to learn more about PRP, schedule a consultation today! At Re:nu 180 Medspa in Southington, CT our licensed staff can help you achieve the results you are looking for! Simply give us a call or visit our clinic, we’ll be more than happy to assist you. Your journey to a better, more confident you is waiting!